Fashion Truffles: A Little Neon: First Outfit Post! A Little Neon: First Outfit Post! Ok, I'm clearly new at this whole outfit post deal. I felt a bit uncomfortable with the neighbors walking by and staring at K and I wondering why we were taking pictures of me by my lonesome. But ok, we got over the weirdness and K finally took three somewhat decent shots (please excuse my awkward posing, the light reflection in the background, and the fact that the shoes aren't really showing.) We most certainly need more practice, but here we go... my first outfit post! Wearing: Theory sweater, David Lerner leggings, DVF boots (old), Madewell necklace (old), Ippolita, Hermes, By Boe bangles. Thoughts or advise? I need some good pointers to look a little less nervous/awkward. YAYY! You're rocking it gorgeous lady! Love that neon and you look beautiful! But seriously, you look like a natural! Viv, you look so cute! LOVE your neon top! and I echo Gaby, maybe some pics outside? But you look so natural for your first one- yay for us breaking into the outfit world! That bright color looks wonderful on you! I could never wear it in the dead of winter. I have no advice on the pic thing, I am terrible with it myself. Looks great! Love that sweater. I'm so happy neon colors are on trend right now..they make each day a little brighter! Looking good! I am loving neon right now and you wear it well! Cute boots! Congrats on your first outfit post! I too would feel very scared and ackward at first, but you look fantastic!!! Way to put yourself out there. Love the mesh-like sleeves. You rocked it. Oh the embarrassing outfit photo shoots... I do mine with a tripod and away from anyone in hopes to reduce the judgement. Love the outfit! Love the sweater! You're so pretty. I love your outfit! I'm obsessed with the neon trend right now. GORGEOUS!! I wouldn't change a thing! Love your neon top! You look great! I am right there with you- I tried an outfit post once but felt so awkward being by myself. Still- you pulled it off well! Adorable. You look so pretty!!!! Love that citron top. I admire you for even going for it and taking outfit pics...I look terrible in photos and J definitely does not have the patience to take pictures of me!!! Love the sweater! Such a huge fan of neon! LOVE this outfit! I really need to get some neon going on in my wardrobe!! What I like to do when taking outfit pics is to have whoever is taking my pic make me laugh... normally turns out cute..sometimes scary.. but give a more natural body language! I am no pro but it helps me a bit!! Just discovered your blog and love it. Love your outfit post as well, you look great. I'm not so keen on having my photo taken as you'll see in my latest post where I've taken to chopping my head off...hehe. You have a new follower sweetie! 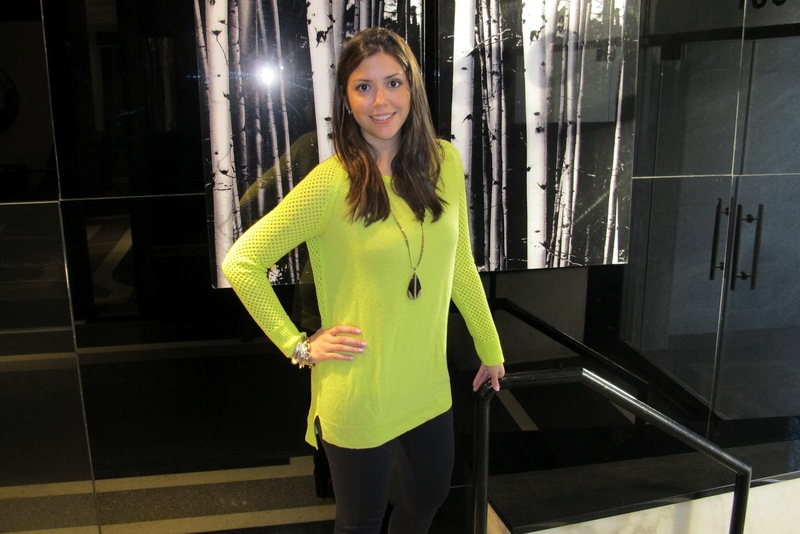 I've been LOVING neon recently and this sweater is perfect! I love the necklace with it as well! Love the outfit! I think you look great, and it takes a lot of confidence to do an outfit post, I am still a little nervous to do so! Look forwarrd to seeing more of your looks! YAY on your first outfit post! I love it! Love the neon! Especially becaue you kept the rest simple. Looks adorable! Love the outfit post! The theory sweater looks amazing!!! Girl, you can rock the neon!! Love the look on you. You're so cute! Love your necklace with the neon! you look great! i'm totally awk with solo shots, so i don't have advice, but you look super cute! You did it!! YAY!! Love the outfit. Stealing the sweater. just saying. Hey fashionista. I super love your outfit! Super cute! Agreed, doing an outfit post is a bit awkward. I'm still trying to get brave and do my second one. You look fabulous! I'm dying over your sweater. It's a great color on you! That's so funny, because I am planning on doing my first outfit post next week and I'm a tad nervous about it. I love your outfit, and I think you did a great job! Looking forward to the next one!